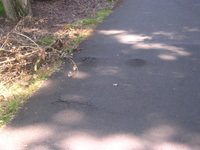 Pavement broken by tree roots is an example of one roadway hazard faced by bicyclists. Seattle's current (2013) bicycle network is over 300 miles in length, including 78 miles of bicycle lanes and climbing lanes, 92 miles of shared lane pavement markings, 9 miles of neighborhood greenways, 47 miles of multi-use trails, 128 miles of signed routes, and over 2 miles of other on- and off-street bicycle facilities. Moving forward, the city's Bicycle Master Plan Update (November 2013) identifies over 450 miles of new or upgraded facilities, including off-street paths, protected bike lanes (cycle tracks), neighborhood greenways (bicycle boulevards), in-street minor separation (bike lanes), or shared streets. Over 95 percent of this planned bicycle network is on existing streets. Even bicycle trips that involve the use of a trail typically involve on-street elements getting to and from the trail. Bicyclists riding on city streets often encounter road hazards that can cause them to suddenly weave, which can cause a conflict with motor vehicles or a fall. The presence of hazards may discourage people from riding. 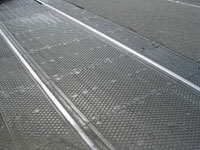 Typical road hazards include drainage grates that catch bicycle tires, drainage grates that are either above or below the road surface, gaps between pavement seams, gutter pans that are too wide, poorly placed or slippery utility covers, railroad tracks that cross streets at obtuse angles, textured crosswalks that are slippery or excessively bumpy, pot holes, rough pavement around utility patches, and pavement broken by tree roots. Rail tracks can present a problem for bicyclists. Seattle's solution has been to institutionalize good design practices into standard plans and specifications and to establish a "Bike Spot Safety Program." Drain grates: Standard, required specification grate is baffled in a way that prevents bike tires from getting caught in the gaps; drain grates are required to be flush with the street. Seamless curbs: New, concrete streets have seamless curbs that are integrated into the curb lane (no gutter pan). Utility covers: Where possible, utility covers are located outside the travel area for bicyclists; utility covers must be flat, have texture and be void of unnecessary protrusions that could divert a bicycle tire. Utility cuts: Utility cuts must be repaired twice, once with a temporary patch to allow for settling, and later, with a permanent patch. Tree roots creating bumps and cracks in the pavement. The intent of the Bike Spot Safety Program is to make low-cost repairs and improvements that enhance bicycle safety and access on Seattle's streets. The program relies on citizens to identify problems that need attention. Utilizing citizen input is done with the recognition that the bicycling public is going to have the best knowledge and information as to where problems exist. Additionally, city staff simply does not have the time to spend riding the streets to identify all problems that need attention. The city has developed a Citizen Bicycling Improvement Request form that can be found online and is distributed to bike shops, community centers, and published in the local bicycle club newsletter. On one side is space for an individual to fill out the location and nature of the problem and their name, address and phone number. The other side has the address of the bicycle program and a place for a stamp, which allows the request form to be mailed without the use of an envelope. Forms can also be submitted on the web or via the city's "Find It, Fix It" smart phone application. With Find It, Fix It, reporting an issue is as easy as snapping a photo with your smartphone, adding detailed information, and hitting submit. The map's "drag and drop" feature or the phone's own technology can be used to pinpoint the location. When the form or internet request is received by the bicycle program, a staff person makes a quick assessment of the request and calls or emails the person who submitted the request to let them know that: a) the problem will be fixed; b) the problem needs further investigation; or c) the problem is something that the Bike Spot Safety Program cannot address. In all cases, the staff person makes sure to let the resident know about how long it will take to respond to their request. A pothole, for example, may be filled in 24 hours while a bike rack request might take six weeks to install. After the resident has been contacted, the next step is to determine whether a field check is needed. Typically, a field check is not needed on routine maintenance items such as a request to sweep a bike lane. Field checks, however, are required for requests involving other improvements such as the installation of signs and bike racks. Once the field investigation is completed and a determination is made to make an improvement, a work instruction is filled out and electronically sent to the appropriate city crew. The crews then do the work and electronically notify the bicycle program that the improvement has been completed. Bike Spot Safety Program staff then call the resident who originally made the request to complete the loop. Eliminating road hazards for bicyclists reduces the number of locations where bicyclists can fall or be diverted into the path of motor vehicles. However, Seattle has not been able to draw a direct cause and effect relationship between the Bike Spot Safety Program and institutionalization program and a reduction in crashes or an increase in bicycle ridership. The Bike Spot Safety Program is an important program administered by the Seattle Bicycle Program to improve safety. Additionally, residents appreciate the quick turnaround on the initial request and don't mind waiting a few months for an improvement as long as they know when it is coming. In many cases, they are delighted just to have someone who listens and responds to their concerns. The program has won many friends by making a special effort to give priority to requests from persons with disabilities. The program is also popular with elected officials and other decision-makers since it generates thank you letters and phone calls. Something is always occurring on the street, which demonstrates that "something" is being done. Finally, it helps the city defend itself against liability claims since it can be demonstrated that there is a safety program which quickly responds to maintenance concerns. The results of the program to institutionalize good design practices into standard plans and specifications have been equally successful. In almost all cases, streets are being re-built in a more bicycle-friendly design as a matter of routine accommodation. This is true of both public and private projects. One of the keys to success is to make sure that on private projects the city inspectors know the design requirements and are willing to stay on top of the contractors to make sure they do it right. One key to the Bike Spot Safety Program's success has been to work with existing maintenance programs that pay for many of the bike spot projects. 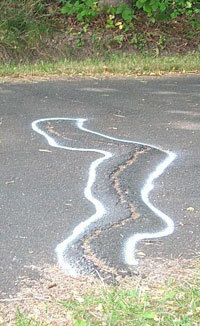 For example, Seattle has a "Pothole Ranger" program where a crew does nothing but respond to pothole requests. The bike spot program simply adds a few requests to this existing program. The Bike Spot Safety program spends a minimum of $200,000 per year. Since individual improvements are relatively cheap, the amount dedicated to the program is flexible. More money means more improvements. In lean years when funds are scarce, fewer improvements are completed.